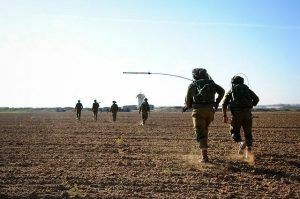 Israeli military exercise near the Gaza border. 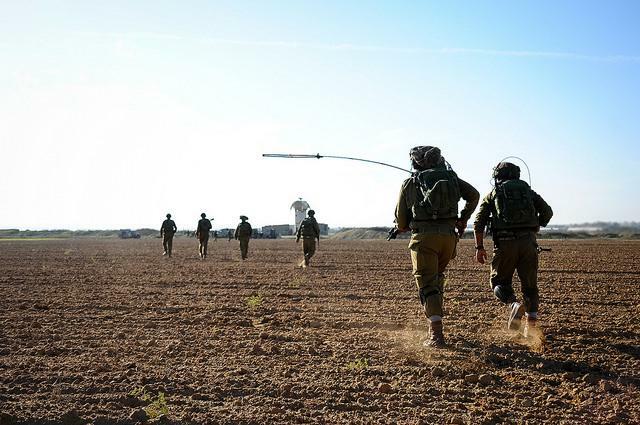 Photo: IDF. Flickr. Some rights reserved. The Israeli government has formalised a flawed definition of antisemitism that includes ‘exceptional criticism’ of Israel. It is summer 2014, the height of the most recent Gaza war. With around twenty fellow members ‘Jewdas’ – a group of self-proclaimed leftwing Jewish anti-zionists, are assembled opposite Brighton Pavilion. I’m there to picket a demonstration by ‘Sussex Friends of Israel’. We read out the names of the Palestinian dead – a figure that by that point was already in the hundreds – only to be half drowned-out by the boos of the larger of demonstration. In short, debates around antisemitism in public political discourse are nothing new to Jewish people. They’ve been rattling on for years – indeed, for centuries. What counts as antisemitism? Who can claim to speak for Jewishness? How can we talk about the frequently-fudged difference between antisemitism and anti-zionism without people actually throwing punches? On the other hand, I’m tired. May’s announcement unashamedly recruits incidents of antisemitism to bash her opponents at Westminster. Once again, we see antisemitism weaponised as a tool of political convenience. It smacks of the idea that such attacks matters only by the grace and favour of some powerful people who have realised that they can leverage it to their own advantage. The prime minister does, of course, pay lip-service to the importance of eradicating bigotry. But here’s the thing: I simply don’t believe her. And not just because she’s used the reform to take a cheap potshot across the speaker’s bench – but because if she were genuinely committed to it, she would be routing it out of her own party as well. She would be outraged that when Tory MP Aidan Burley threw a ‘Nazi’ themed party, he was not disciplined by the Conservatives. They deemed him “stupid but not antisemitic”, and he was allowed to serve out his tenure in parliament. She would have raised some concerns that the party campaigned against Ed Miliband by calling him a ‘backstabber’ who couldn’t eat a bacon sandwich properly. She would be outraged that Tory MP Jacob Rees-Mogg has links to the Traditional Britain Group, an organisation accused of antisemitism. And she might be less keen to triangulate the position of UKIP, a party with direct links to neo-nazis. We would perhaps be naive to expect any different from a politician who shows about as much racial sensitivity as a hammer shows the head of a nail. Her tenure as home secretary saw the illegal deportation of thousands of migrants, a policy that overwhelmingly targeted people of colour. One of her first acts as prime minister was to appoint to foreign secretary a man who has publicly called black people “piccaninnies with watermelon smiles”, who claimed that Barack Obama of had an ‘ancestral dislike of Britain’ due to his Kenyan heritage. Such accusations of ‘divided loyalties’ are exactly the type that would land him in hot water, were they covered by this legislation. But then again, we are forced to ask ourselves whether it matters that this move is being used for cheap parliamentary point-scoring. It seems, on face value, a good thing that such protections are being put in place – even if May’s motivations for doing so may be cynical. The definition, after all, is borrowed from the IHRA, and used in many countries over the world as a litmus test for antisemitism. But the inclusion of ‘criticism of Israel’ remains controversial among Jewish communities – such as Jewish Voice for Peace, who claim that it unfairly limits criticisms of Israel. And they have good reason to think so. In the most recent Gaza war the French government banned protests against the Israeli insurgency on the grounds that it was antisemitic. It did not cite specific incidents of antisemitism within the movement. It did not have to; under the auspices of this definition, the movement was antisemitic simply by virtue of existing. In the UK, Prevent legislation builds in criticism of Israel as one of the hallmarks of radicalisation; a provision that saw Rahmaan Mohammadi arrested for wearing a pro-Palestinian badge. And that’s why it matters. Not because the definition of antisemitism is leveraged for gain. Not because those putting it forward are hypocrites of the highest order. But because this definition of antisemitism is fundamentally flawed. It gives the green light to a clampdown on legitimate political criticism of a state repeatedly accused of war crimes, whilst doing little to support victims of violence and abuse – violence and abuse that, it should be noted, is already covered by anti-hate crime legislation. By collapsing the interests of Israel and the interests of Jews, you play right into the antisemitic trope that Jewish identity is inextricably bound up with the maintenance of state power. It sounds rather like the “stereotypical allegations about Jews as such or the power of Jews as collective” that the IHRA directive rightly criticises. Indeed, you’ll hear just as much claimed by your average diatribe on 4chan. But Jewishness isn’t a monolith. There are many Jews for whom criticism of the Israeli state isn’t a matter of being ‘self-hating’ – it’s a matter of self-preservation. Arab Jews face incredible discrimination in Israel. The government recently admitted to sterilising Eritrean Jewish women without their knowledge or consent. And despite being called ‘the only gay-friendly state in the Middle East’, the high court cow-towed to rising homophobic rhetoric by withdrawing permission for the pride parade in the city of Be’er Sheva to march through the main thoroughfare. These targeted Jews might have a thing to say about what May termed a “remarkable” and “tolerant” state. Indeed, there is a strong tradition of Jewish anti-zionism whose proponents include Judith Butler, Noam Chomsky, and Primo Levi. Indeed, in so far as the idea of Zionism came out of Jewish communities, the first anti-zionists were themselves Jewish. The Jewish left Bundists’ uncompromising criticism of Zionism may well have cast them as antisemitics in the eyes of this legislation. Clearly, in the eyes of the gentile citizens of eastern Europe, they weren’t adequately anti-Jewish; they were killed and expelled by pogroms all the same. In a more recent – and thankfully, much lower-stakes – skirmish, an Israeli pro-BDS (Boycott, Divestment and Sanctions) activist caused a considerable ruckus when he ran for president of the Union of Jewish Students. Eran Cohen, an undergraduate at the University of York, is guilty of the same ‘exceptional criticism’ that puts him firmly in the grey area. How it might help him in dealing with the antisemitic abuse that he received throughout his campaign remains unclear. I may here be accused of a lack of nuance. The definition states that criticising Israel is permissible that Israel can be criticised in the same terms that any other state might be criticised. The problem is, that the interpretation of what counts as ‘exceptional criticism’ is tasked to authorities who have not, at the best of times, looked kindly on any criticism of Israel. It sometimes seems like rather a moveable feast. Indeed, a favoured refrain of Israeli ambassador Mark Regev is to point out the crimes of other countries, and claim that that people are unfairly targeting Israel for criticism; even when those criticisms are to point out the somewhat exceptional fact that its political settlement has been repeatedly compared to those of apartheid South Africa, and that it stands accused of multiple war crimes. The charge of ‘exceptionalism’ is used to distract from criticisms that are not only legitimate, but necessary. Israel was established by a mandate from the British government, which colluded in the expulsion of thousands of Palestinians from their homes, and for whom it has since been a key strategic ally in disastrous foreign incursions into the Middle East. In this context, singling out Israel for criticism is not antisemitic. It is to attempt to right the wrongs in which your country has colluded. So, we seem to be left with a definition that fails to distinguish actual abuse from legitimate criticism, proposed by a government riddled with racism. A definition which then leveraged to attack left-wing politics both inside and out of Westminster. In this light, it’s somewhat understandable that the knee-jerk reaction of some leftist groups is to flatly deny the charges, and become suspicious that any charge of antisemitism is some rightwing diversionary tactic. Understandable perhaps, but profoundly wrong and incredibly dangerous. The problem is this: leftwing people, despite what some people may tell you, are humans living in the world. They are as exposed as anyone to antisemitic tropes, and left-wingers have proved themselves more than capable of lazily reproducing tired tropes about Jews secretly controlling the world. That it would be convenient for the right if the left were shot through with antisemitism does not in fact mean that the left is not shot through with antisemitism. The fact that anti-zionism is different from antisemitism doesn’t mean that anti-zionists cannot be antisemitic. Journalist Emily Hilton reports that she attended a Momentum meeting where a woman “voiced her concern about the likelihood of “the Rothschild Banking state” taking over. Another jewish activist told me that they encounter “a lot of subconscious biases”. In a discussion about Iran, they were questioned about “where their loyalties really lie”. As someone who struggled to remember where they left their keys, it’s occasionally gratifying to entertain the idea that I’d be capable of orchestrating a secretive system of world control. But it’s pretty horrifying to think there are people knocking around the ‘anti-racist’ left who genuinely hold these kinds of views. If people on the left fail to honestly examine antisemitism, this will only be allowed to fester. It will only further alienate Jewish people; and perhaps rightly so. It leaves reactionaries and demagogues to draw the lines around what counts as acceptable public discourse. And, furthermore, it plays right into the hands of the insidious hasbara that equates Jewishness with the Israeli state. It’s easier to push the line that you’re defending the interests of all Jews when even your critics claim that you’re representing the interests of all Jews. So if we want to embrace a more nuanced, pluralist vision of Jewishness, we must question this definition of antisemitism. If we want to open up a space to legitimately criticise Israel, we must challenge the way it’s mobilised to quash dissent. But any effective attempt at either of these must be accompanied by honest introspection, by a willingness to challenge genuine antisemitism wherever we find it: even, and especially, in our own ranks.